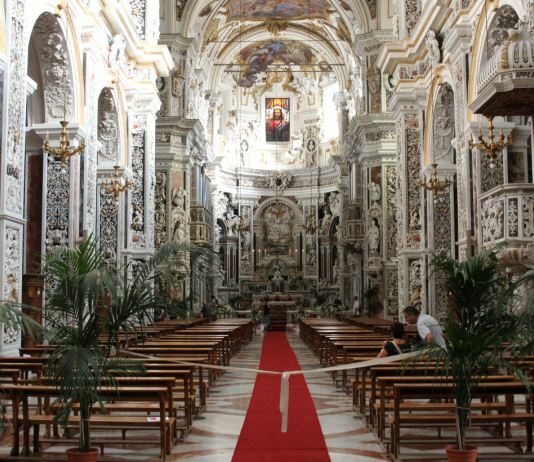 The Church of Casa Professa, also known as Chiesa del Gesù (Church of the Jesus),is probably the most important baroque church of Palermo, and one of most beautiful in Sicily. Casa Professa was founded by the Jesuits, who arrived in Palermo in 1549. In the late 16th century, the architect Giovanni Tristano began building a church by the mother house of the Jesuits (called Casa Professa). The original project called for a single nave church with several chapels on the sides, however, this design didn’t reflect the magnificent layout typical of Jesuit architecture. For this reason in the early 17th century the side chapels were replaced by two additional naves. In 1936 the church was finally consecrated. The interiors include some of the most beautiful marble decorations in Europe. The columns, the tribuna and the chapels, are adorned with amazingly detailed marble bas-reliefs, made by some of the best Sicilian sculptors of the 18th century. Among these decorations must be mentioned the Adoration of the Shepherds (1710–14) and Adoration of the Magi (1719–21), by Gioacchino Vitagliano and the Glory of St Luke by Ignazio Marabitti. In 1888, thanks to Salvatore Di Pietro, member of the Theological College, of the Academy of sciences, letters and arts and of the Sicilian History Accademy, Casa Professa was declared national monument by the Italian authorities. In 1943, during the Second World War, a bomb destroyed the church’s dome and most of the surrounding walls. That required a long restoration, finished in 2009. The facade of the church is divided into two sections. In the lower section there are three portals, the central one bigger than the others. Above the front doors there are niches with statues of St Ignatius of Loyola, a Madonna with Child and Francis Xavier. In the upper section is decorated with pilasters and statues of saints. On the top of the facade, the Jesuit emblem declares the origins of this church. The nave is decorated with stucco decorations, polychrome marbles mosaics, frescoes and unique marble reliefs with figures and ornaments. 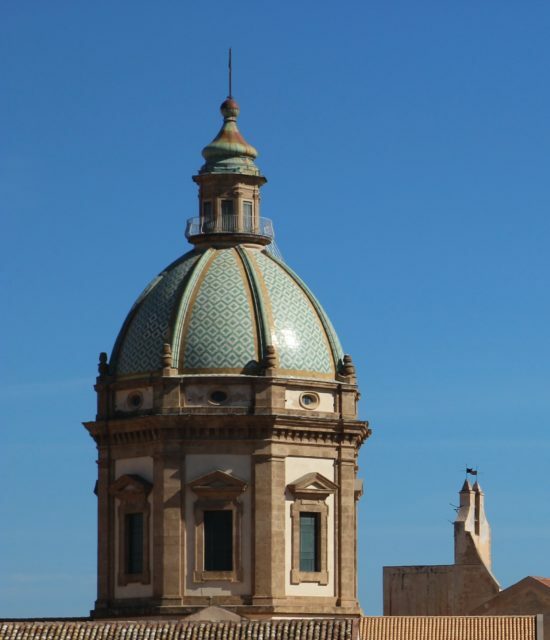 The dome, with its stained glass windows, is one of the tallest and biggest of Palermo, and is easily recognizable by its fine green and white geometrical decorations.